Higurashi no Naku Koro ni Rei (ひぐらしのなく頃に礼, When They Cry: Rei?) 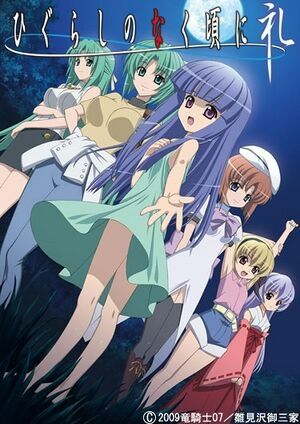 is the first Higurashi no Naku Koro ni OVA. The anime adapts the third Higurashi no Naku Koro ni light novel as well as Saikoroshi-hen and Hirukowashi-hen. Forgetting to pack his bathing suit and rushing to meet his friends at the pool, Keiichi borrows a pair of trunks from Mion's uncle, who claims that it has the magical ability to make women attracted to whoever writes their name on them and wears them for three hours. Mion learns about the suit's ability and that the person's identity will fall in love with the wearer, even Keiichi. The girls pursue and tell Keiichi to remove the suit, but he refuses. After the girls rally everyone at the pool, Tomitake, Oishi and Irie remove it from Keiichi and fight over it. The naked Keiichi still refuses to wear the girls' embarrassing trunks. 2 "Dice Killing Chapter One"
While biking with her friends, Rika is apparently killed by the truck. She wakes up in the alternate timeline, only to find Keiichi, Takano, Irie and Hanyu gone. The dam project threatening to flood the town is still underway and none of the tragedy that she witnessed countless times happened, meaning Satoshi and his parents are still around and Rika cannot return to her timeline. 3 "Dice Killing Chapter Two"
Hanyu tells Rika that for her to return to her old world, she must find and dispose of a piece from it to prevent her from entering there. This prevents Rika from reincarnating. If the piece turns out to be a person for instance, she will kill the other. After forgiving Satoko, Rika experiences what life with a mother is like, and builds a new friendship with Mion, Rena, Satoshi and Satoko. Rika reveals to be the matter of deciding which world she would rather like to stay in until she learns that her mother is Oyashiro's reincarnate. 4 "Dice Killing Chapter Three"
Rika remains in the new world without sins and returning to her old world. Learning that she does not have much time to act, Rika decides to fight for what she wants to live for. The next thing she knows, she awakens from a coma in her old world and happily reunites with her friends, the other world having apparently been a dream. Rika concludes she must have killed her mother to regain consciousness. Unbeknownst to her, the dream was developed by Hanyū to teach Rika that people need to work past personal hardships in order to make life worth living. During a picnic with Keiichi, Rena accidentally swallows one of the mysterious "Fuwazaru Magatama" falling from the sky and begins acting lovesick. Rika explains that the seal on the magatama has been broken, and that whoever possesses the red magatama will fall blindly in love with anyone holding its white counterpart. Everyone reasons that Rena swallowed the magatama and sets out to stop her and find the white one. It winds up in the possession of Tomitake, Takano and Oishi, each of whom gradually come to accept her love under the curse. Keiichi obtains it after beating Rena and Oishi with Akasaka in a game of mahjong. Oishi fumbles it and Keiichi ends up swallowing it. Rika lifts the curse, before Keiichi can fall under the power and Rena returns to normal. Rena, being grateful to Keiichi for helping her, expresses her feelings toward him, though she is not sure if it is part of the magatama's power. Tomitake and Takano are infatuated with Rena, and fight over for keeping her. This page was last edited on 29 May 2017, at 21:51.